On July 8th, 2015, Guang Ming Daily published a special report, pointed out that environmental pollution was a leading cause of lung cancer. Meanwhile, it reported the case of a lung cancer patient NGHIEM THI THU, whose tumor shrank obviously after taking treatments in Modern Cancer Hospital Guangzhou. According to some statistics, the morbidity of lung cancer in industrially developed countries was higher than that of less industrialized countries; urban areas higher than rural areas. These were related to severe air pollution, and environmental pollution was regarded as a leading cause of lung cancer. Pen Xiaochi, chief expert of Modern Cancer Hospital Guangzhou, had received a lung cancer patient some time ago. NGHIEM THI THU, who lived under the air pollution for a long time, had suffered from chest distress, dyspnea, generalized weakness and depression since October 29, 2014. The biopsy result showed lung cancer. Although NGHIEM THI THU had received intravenous chemotherapy at the local hospital, her condition did not turn better. She was still plagued by the symptoms of dyspnea, dry cough and pain in the left lung. NGHIEM THI THU always insisted on finding a better hospital and therapeutic plan. She happened to know that a lung cancer patient had gained good efficacy after taking treatments in Modern Cancer Hospital Guangzhou. It’s said that the patient used to be tortured heavily by the lung cancer, but now could work normally. Therefore, she decided to go to Modern Cancer Hospital Guangzhou for treatment after discussing with her family. The doctor first performed systemic physical examinations for NGHIEM THI THU after she was hospitalized. The examination result showed that NGHIEM THI THU was suffering with poorly differentiated adenosquamous carcinoma of left lung, with metastases to pleural and mediastinal lymph nodes, and severe pleural effusion. According to her condition, Professor Peng Xiaochi and the multidisciplinary team (MDT) from Modern Cancer Hospital Guangzhou stayed up making her a therapeutic plan: first empty the pleural effusion, and then perform the interventional therapy. Interventional therapy is a mini-invasive therapy performed under the guidance of medical imaging equipments, which introduces a special tube, catheter or other sophisticated apparatus into human body to deliver chemotherapy drugs to the tumor. The drug level is above 80 times, which can directly kill the cancer cells. Facts proved that this therapeutic plan was suitable for NGHIEM THI THU. After taking intravenous chemotherapy at the local hospital, she felt tired, weak, and could not eat and sleep. 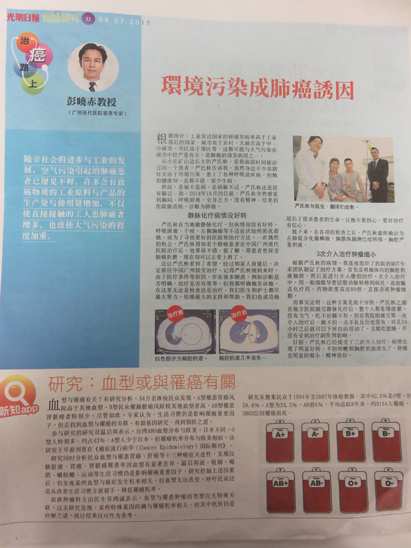 However, there were no adverse reactions after taking the interventional therapy at Modern Cancer Hospital Guangzhou. 24 hours later, NGHIEM THI THU was even able to move around, could eat and sleep normally. After three sessions of interventional therapies, NGHIEM THI THU’s condition tuned better. Symptoms like coughing and pleural effusion had disappeared, and her tumor had shrunk obviously.